If you’re looking for an opportunity to get involved and give back to your community, consider participating in Comcast Cares Day. Comcast Cares Day is the nation’s largest single-day corporate volunteer effort where Comcast employees, community partners, non-profits, families and friends all join together to clean, rejuvenate and beautify projects throughout New Mexico. In 2016, 3,500-plus volunteers made change happen by participating in nine different projects throughout New Mexico. 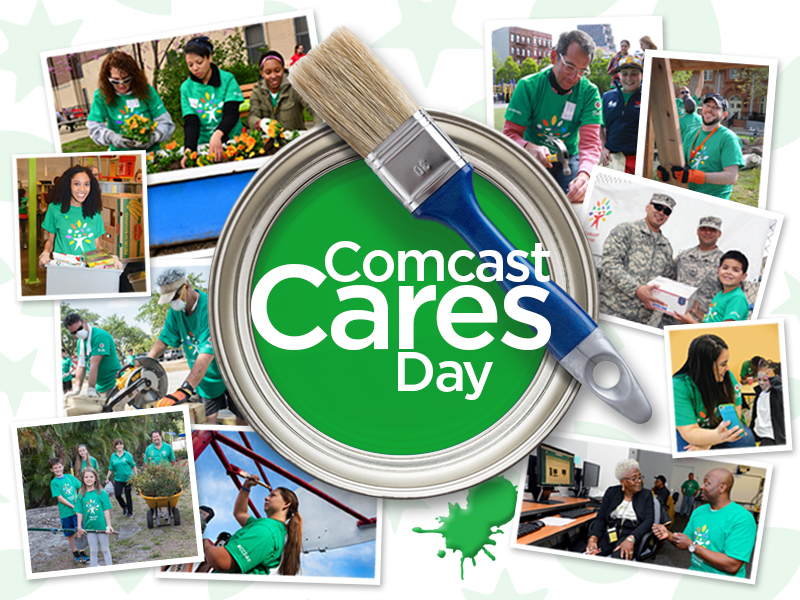 This year, Comcast Cares Day will take place on Saturday, April 22. The day will begin with sign-in and breakfast and conclude with lunch for all volunteers.. Sign up to volunteer online at www.ComcastInTheCommunity.com or view individual projects below and sign up through the direct links. Albuquerque: Lavaland Elementary School, 501 57th St NW | 8:00 a.m. – 1:00 p.m.
More than 400 Comcast volunteers will help improve Lavaland Elementary School by cleaning up around the school, painting a map of the USA on the playground, and installing new basketball nets. Volunteers will also improve the school’s community garden by pulling weeds, picking up trash, building gardening boxes, painting benches, adding garden soil and planting seedlings. To register, please click on the following link. Deming: Cancer Support of Deming & Luna County, 217 N. Country Club Road | 8:00 a.m. – 12:00 p.m.
More than 350 volunteers will help beautify Cancer Support of Deming & Luna County by picking up trash, pulling weeds, and planting new shrubs. To register, please click on the following link. Farmington: Navajo Preparatory School, 1220 W. Apache St. | 8:00 a.m. – 1:00 p.m.
More than 125 volunteers will improve the school by installing new landscaping and creating a basketball and picnic area at the school. To register, please click on the following link. 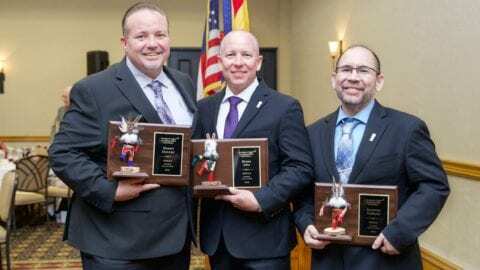 Gallup: Veterans Helping Veterans, 631 North 4th Street | 7:30 a.m. – 12:00 p.m.
More than 100 volunteers will partner with the Gallup Food Pantry to improve the Brothers in Arms facility by painting the recreation floor, trimming trees, pulling weeds, removing trash and much more. To register, please click on the following link. Las Cruces: Tombaugh Elementary School, 226 Carver Rd. | 8:00 a.m. – 12:00 p.m.
More than 1,000 volunteers will help improve Tombaugh Elementary School by painting walls and buildings, pulling weeds and cleaning up the playground area. To register, please click on the following link. Portales: Food Bank of Eastern New Mexico, 200 E 7th St | 8:00 a.m. – 1:00 p.m.
More than 250 volunteers will help the Food Bank of Eastern New Mexico provide food to elderly and physically challenged residents of Roosevelt County by creating food baskets to be delivered to residents of Roosevelt County. To register, please click on the following link. Santa Fe: The Food Depot, 1222 A Siler Road | 8:00 a.m. – 12:00 p.m.
More than 500 volunteers will repackage food at The Food Depot for more efficient distribution to Santa Fe families in need. To register, please click on the following link. Silver City: Mimbres Region Arts Council, 1106 N Pope St | 8:00 a.m. – 1:00 p.m.
More than 1,000 volunteers will bring out their artistic side at the Mimbres Regional Arts Council as they create an art installation to beautify Silver City. To register, please click on the following link. Tucumcari: Tucumcari Little League Fields, 1500 Historic Highway 66 | 8:00 a.m. – 2:00 p.m.
More than 275 volunteers will repair fencing, paint bleachers, lay dirt and install new bases at the Tucumcari Little League fields. To register, please click on the following link.